Welcome back to this series all about staying safe in a small workshop. In part 1 we talked about first aid in a small workshop, then in part 2 we discussed some health and safety basics. In this article I’m going to take you through what goes through my mind when operating my table saw. Before even attempting to use a table saw you should make sure you’ve read and understood the supplied instructions that came with your saw. I would also advise reading the UK HSE guide here. Don’t use a table saw! Is there a more appropriate tool you could be using? Although the table saw is often the hub of the workshop, it should be viewed as the tool of last resort. Obviously there are always going to be some cuts where this is physically impossible. For all the other cuts, always use the riving knife and blade guard. The riving knife is designed to save your life and prevent kick-back. We covered this in part 2, but make sure you cover the basics. Eye protection, respirator and hearing protection as required. Whether you do this mentally or physically is up to you, but before you switch the table saw on, plan where you’ll be at the start of the cut and at the end of the cut. Music off, podcasts off, make sure anyone who might come in to your workshop knows not to disturb you while the tools are running. Use your push stick to push whatever you’re cutting COMPLETELY past the blade. Push it as far past the blade as you can manage without leaning over the blade. Don’t use the table saw for wide cuts at all if possible. If you really have to, use the mitre fence and make sure the piece doesn’t touch the main fence. If you’re cutting wide pieces, using the push stick towards the blade (instead of towards the fence) will help to stop the inclination of the piece to rotate, potentially causing kickback. Don’t lean over the blade! It sounds obvious, but if you’re using the wrong type of push stick you could end up in a situation where you have no option but to lean over the blade. Just don’t. Do everything you can to avoid leaning any part of your body over the blade, ever. Hit that stop button, hold everything firmly in the same location. Don’t continue with the cut and avoid backing out of the cut. Wait until the blade stops and then work out what has gone wrong. You should ALWAYS be using either the main fence or the mitre fence, NEVER both at the same time. Alternatively obviously you could be using jigs, but never use a table saw freehand. If you have any blade adjustments to make – such as removing the riving knife, changing the blade or anything else that would put you at risk if the saw accidentally turned on, turn the power off at the mains first. Riving knives should be thicker than the body of the blade but slightly thinner than the teeth of the blade (the kerf). Complacency is the killer – if you’re making a lot of identical or similar cuts, take regular break to avoid complacency kicking in! If something goes wrong you don’t want to over balance and end up with your face on the saw. 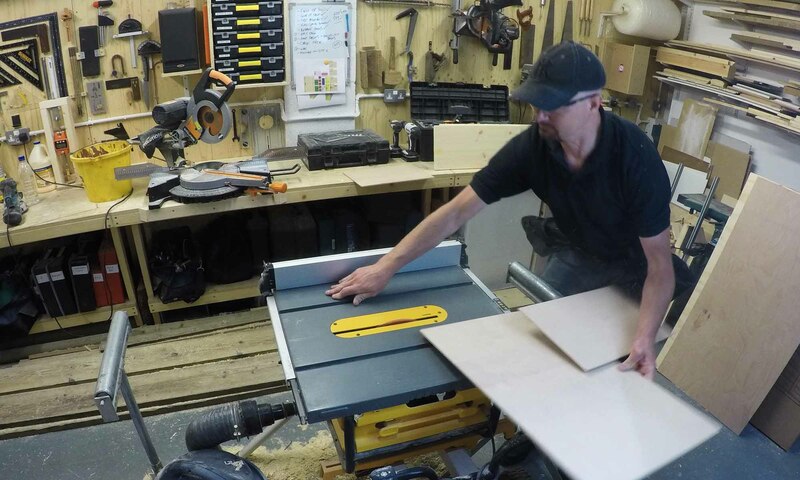 Ensure the wood being cut is suitable for use on a table saw. It should be dry, seasoned, free from nails, debris and other detritus. Only use sharp, good quality blades suitable for the work you’re cutting. Ensure the blade is tight, the fence is parallel and the table is waxed. Forget about the 3″ rule or the 6″ rule. Just ALWAYS use a push stick unless you consider it safer not to. Get in to the habit of using the push stick for EVERY cut. 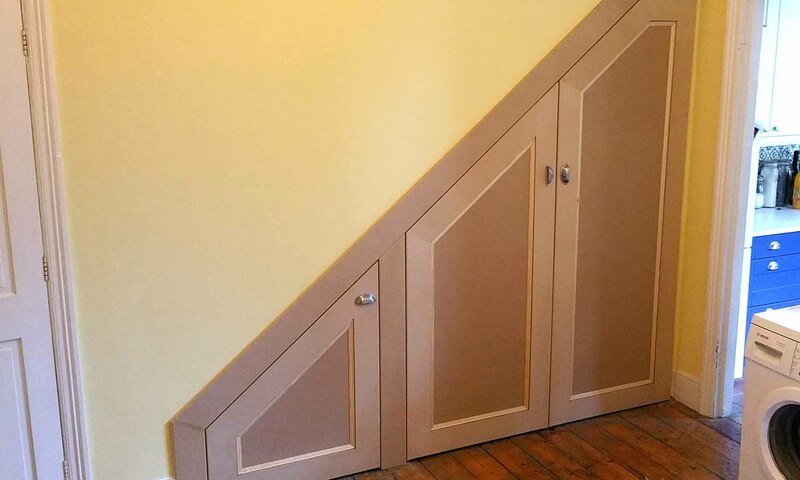 Big of a channel update today and I’ll also finish off by giving you part 2 of the under stairs storage job walkthrough. Lots of updates include a brand new section of the channel – enjoy! 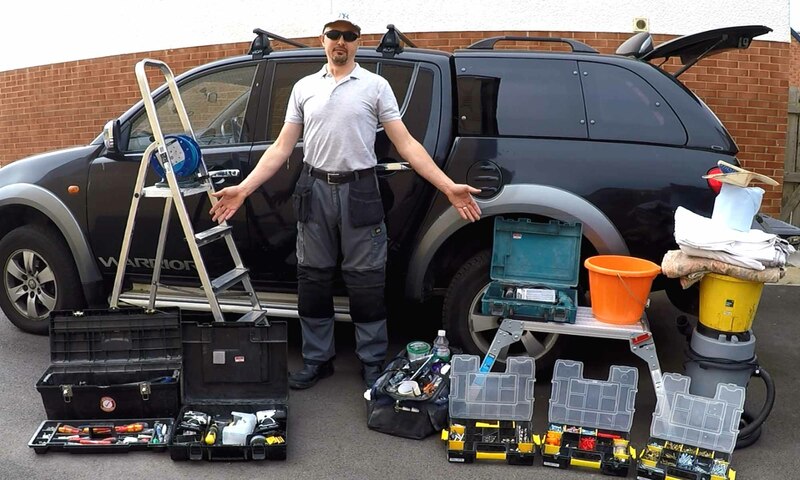 I don’t often do handyman jobs these days but I’m just back from doing some bits & pieces for a regular customer and thought I’ve give you a quick run-down of everything I take with me on ALL handyman jobs. 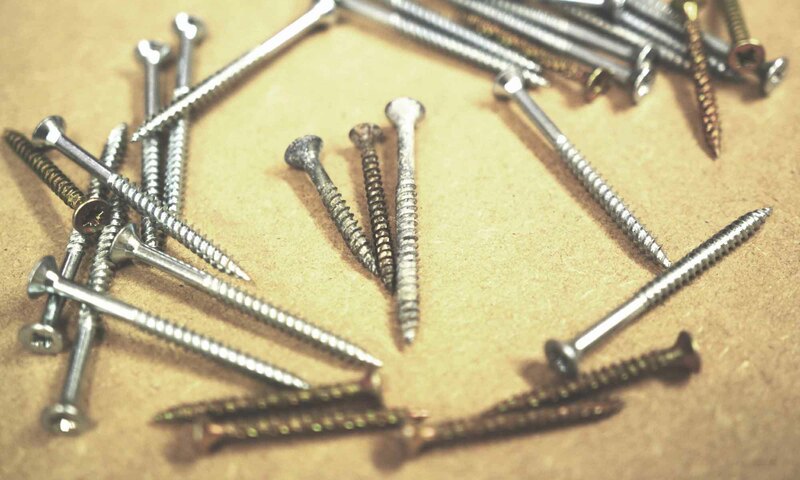 As well as these being tools for handyman jobs I also take this full set of tools to most joinery jobs along with all the other usual staples for carpentry work on-site such as the track saw, work bench, clamps, planes, jigsaw and a whole host of other gear. This is just my essentials.